After indulging in this cake at a recent party at a friend of mine’s house, I asked for the original recipe, which was from Eating Well, and made a few alterations to make it a bit more Weight Watchers friendly. Plus, I wanted to make it easier….their original banana cream layer cake recipe calls for making your own bavarian cream filling, but I just wasn’t a fan of the flavor of the cream or the hassle of preparing it. But by using Nonfat Cool Whip mixed with fat free vanilla pudding instead, I got a better flavor, it was much easier, and it lowered the fat and calorie count – a LOT. If you aren’t a fan of Cool Whip, you can use Fat Free Reddi Whip too (which I LOVE), but it does get runny kind of fast, so prepare for that. Though it tastes fantastic. 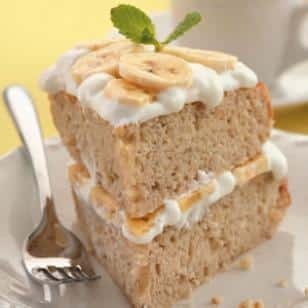 So if you want a great summer dessert recipe that will help you stay on track with your Weight Watchers goals, this Banana Cream Cake is a must try. With only 6 Points per slice, you can have your cake and eat it too! Indulge in this guilt free, low calorie Banana Cream Cake Recipe and stay on track with your Weight Watchers Daily Points Allowance. Each slice is creamy, moist, decadent and just as good as a homemade banana cream cake recipe, but without the excess fat and calories. To prepare cake: Preheat oven to 375°F. Coat two 9-inch round cake pans with cooking spray and line the bottoms with wax paper or parchment paper. Whisk eggs, 1 cup sugar and oil in a large bowl. Stir in mashed bananas, buttermilk and 1 teaspoon vanilla. Stir whole-wheat flour, all-purpose flour, baking powder, baking soda and salt in a medium bowl. Add to the banana mixture and fold in just until blended. Divide the batter between the pans. Bake the cake until the tops spring back when touched lightly, 20 to 25 minutes. Let cool for 5 minutes, then turn out onto a wire rack and let cool completely. To make the cream, gently fold the Cool Whip into the vanilla pudding, in a medium sized bowl, using a rubber spatula. To assemble cake: Shortly before serving, place 1 cake layer on a serving plate and spread half the cool whip cream over it. Peel and slice the remaining bananas; arrange half the slices evenly over the cream. Top with the second cake layer. Spread the remaining cream over the cake and arrange the remaining banana slices decoratively over the top. TIP: If you don’t have buttermilk, or can’t find fat free buttermilk, you can make your own by mixing 1 tablespoon lemon juice or vinegar to 1 cup fat free milk. I would make the frosting for this with cool whip and instant banana cream pudding. That would be yummy! In some of these cake recipes – it calls for 1 cup sugar . Can I use a truvia substitute and if so how do I recalculate the points + value. Cup for cup. Should be less points. Appreciate help with this. i am making this as a banana bread tonight and bringing some to work yay! YEA THIS IS SOOOOOOOOO THICK! iits more of a banana bread (duh i know) than a cake! but my hhubby likedt! i have this in the oven and i didn't have round cake pans, so i used pie pans and this is taking FOREVER to cook! everytime i take it out it still isn't done in the middle…..so afraid this is going to taste dry! I just love this site!! I am however at a point where sweet is a MUST!!! I have found such tempting recipes on this site, but am curious as to the points + values or how to calculate them from the previous points calculations!! The chocolate ones look sooooo delish!! how to find the + as apposed to the points??? Until I get around to remaking these recipes and recaluclating the new PointsPlus values, the only way to figure out the PointsPlus value is to actually calculate the recipe ingredients yourself as you make it. It's a PIA, I know, but unfortunately, I haven't gotten around to re-configuring all of my old recipes yet. Thanks for reading!